The Inter-university Consortium for Political and Social Research (ICPSR) Summer Program in Quantitative Methods of Social Research is a complement to data services provided by Seton Hall University Libraries. The summer programs (most held in Ann Arbor, MI) provide rigorous, hands-on training in statistical techniques, research methodologies, and data analysis. Last year’s workshops included R programming, time series analysis, regression analysis, Bayesian modeling, and longitudinal analysis. These programs are excellent professional development opportunities for graduate students and faculty. As a subscriber, Seton Hall receives a 40% discount on tuition. Additionally, from May through August 2019, ICPSR will offer dozens of short workshops on a variety of topics in Ann Arbor and other locations around the world which will be posted in January 2019. Official registration for all 2019 courses will open in early February 2019. The ICPSR Summer Program offers several scholarships that provide registration (tuition) fee waivers for the 2019 four-week sessions. Please refer to the Financial Support page for more information about how to apply. Questions about ICPSR @ SHU? #SHU_Libraries wishes to inform everyone that we will be cancelling our subscription to the PIVOT funding database, effective Sunday, March 31. 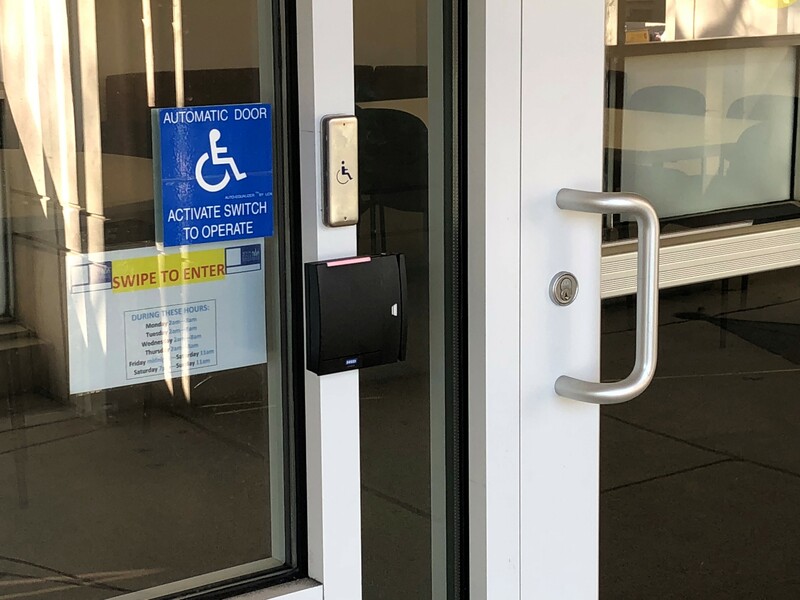 Our reasons for cancelling PIVOT include low usage, little interest in maintaining PIVOT from other campus stakeholders, and a significant financial cost to the library to provide access to Pivot. Anyone who has an active account with PIVOT, will no longer receive funding alerts, and your login access to the database will expire on this date. We sincerely apologize for any inconvenience this may cause to PIVOT users. With March upon us an increased interest in learning about the culture, history, individuals, events, and traditions associated with the Irish experience is both evident and welcome! However, when it comes to finding resources related to both Éire proper and Irish-America alike we offer year-round opportunities to study a wide-range of subject areas related to, and inspired by Ireland proper. 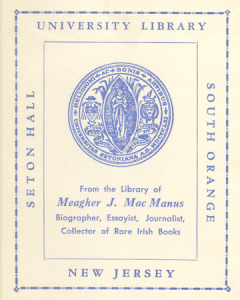 The Archives & Special Collections Center at Seton Hall University features a group of printed volumes from the collection of Irish literary figure and noted book collector Michael Joseph (Meagher) MacManus (1888-1951) who wrote various nationalist-themed books and worked as editor of the Irish Press from 1931 until his death two decades later. 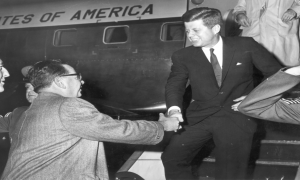 This library includes over 3,000 titles dating from the seventeenth century to the present day and covers several different aspects of Irish and Irish-American life including culture, geography, literature, politics, biography, history and religion. Nearly all editions are printed in either English or Irish (Gaelach). The core of this collection consists of acquisitions secured by MacManus during his lifetime, but arrangements have been made to add latter day works to what has become a continuously expanding bibliography. and complimented by one specializing on Irish Literature: Past and Present – https://library.shu.edu/irishlit compiled by Professor Gerry Shea. Another collection donated by Rita Murphy (1912-2003), achieved status as one of the first female graduates of Seton Hall in 1937, prior to becoming a long-time director of the Irish Institute at Seton Hall during the 1950s and 1960s. She also hosted a weekly Irish Music Program on W-S-O-U FM, South Orange and frequently appeared on local television. 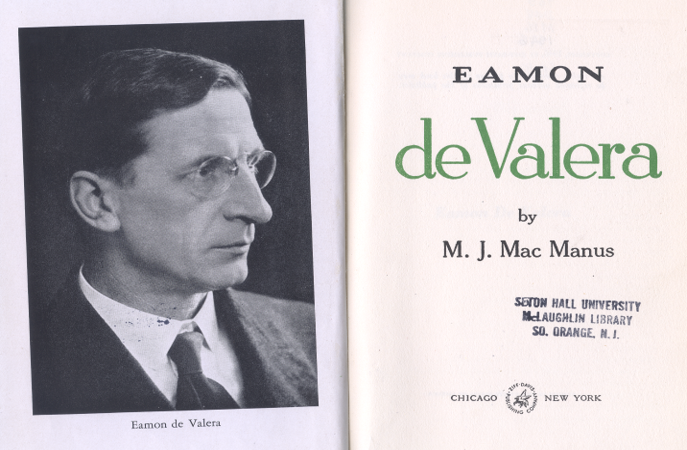 Her collection of nearly 1,000 titles are complimented by other important works donated by prominent donors of Irish titles including the recently acquired Emmet-Tuite Library of volumes focusing on varied aspects of the Irish experience printed between from the 16-19th century, noted New Jersey based journalists Barbara O’Reilly; Jim Lowney and noted advocate Jim McFarland whose bequest centers on focused materials related to political issues in Northern Ireland over the past few decades. Counted among our major subject collections featuring Irish subject matter include the reference papers of John Concannon (1924-2011) former author, publicist and National Historian of the Ancient Order of Hibernians whose voluminous source material on Ireland and Irish-America is especially detailed with particular emphasis on parades, noted political and military figures. In addition, the Center houses microfilm editions of the National Hibernian Digest (1905-97), Hibernian Journal (1907-69), and Convention Proceedings of the AOH in America (1888-1990). Various materials including ledgers, documents, and other items representing the New Jersey AOH have also found a central place within our collection. When it comes to family ties and Irish-connected genealogy, the presence of church census data, select religious community information, educational files and various institutional and parish records are also found within this collection. Original and microfilmed nineteenth and early twentieth century sacramental registers from both current or closed parishes and various local cemeteries provide a wealth of data for those conducting genealogical research for their Irish and Irish-American ancestors either on-site or via mail inquiry. Supplementing these distinctive resources are bound or microfilm copies of Catholic Almanacs and Directories dating from 1851 onward. In terms of manuscript collections individual figures with Irish surnames have also been featured prominently in the organization of archival collections featured at Seton Hall through University connections including such academics and former presidents as Bernard J. McQuaid (1856-1857 and 1859-1867); James H. Corrigan (1876-1888); James F. Mooney (1907-1922); Thomas H. McLaughlin (1922-1933); Francis J. Monaghan (1933-1936); James F. Kelley (1936-1949); John L. McNulty (1949-1959) and John J. Dougherty (1959-1969). 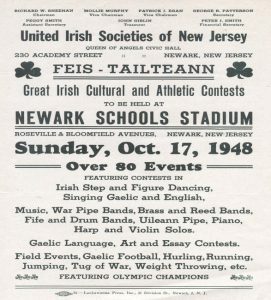 Other prominent collections include resource materials from the laity including Congressman Marcus Daly (1908-1969) of Monmouth County, the first Catholic Governor of New Jersey Richard J. Hughes (1909-1992); and Bernard Shanley III (1903-1992), political advisor to President Dwight Eisenhower to name a few. 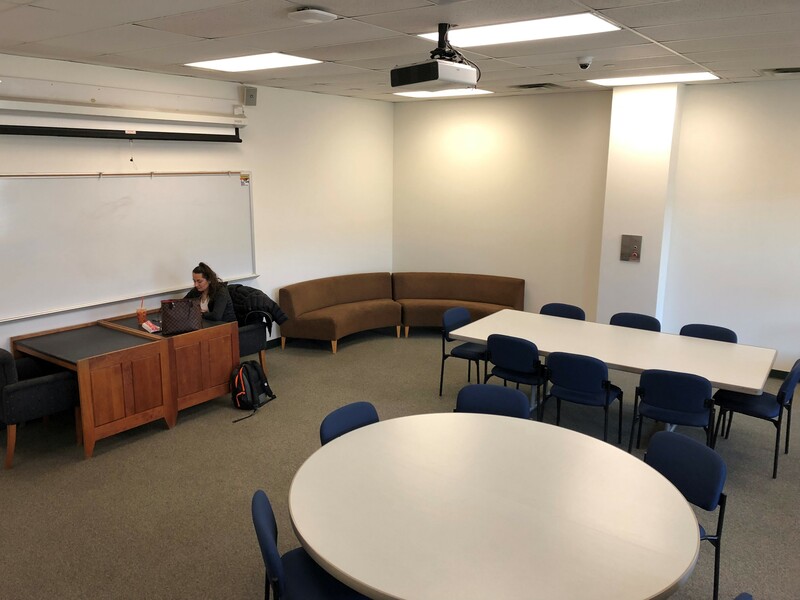 #SHU_Libraries At long last we are pleased to announce the opening of the new After Hours Study Space! 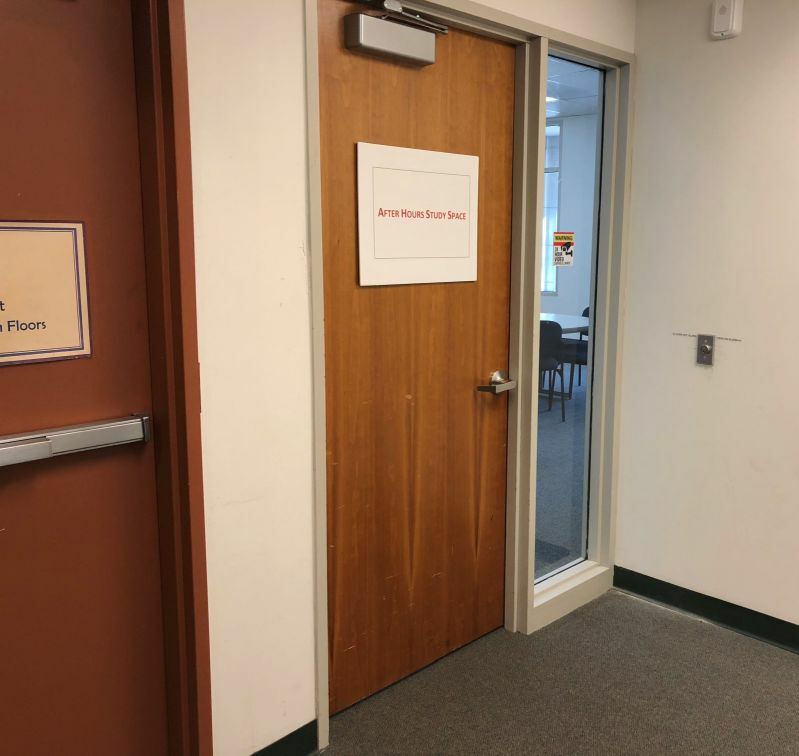 During the library’s regular operating hours, the room is open and available with entrance/exit only from within the library through the wooden door. We hope students make use of the room and support our efforts to make the library more accessible! #SHU_Libraries is pleased to announce the latest edition of the library newsletter “The Whipstitch” is now available! View the March 2019 issue of The Whipstitch. 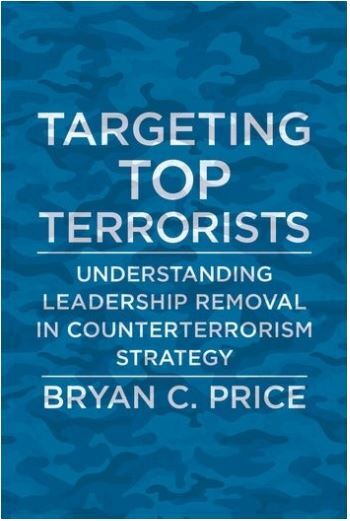 Free copies of the book for the first 15 students to arrive!